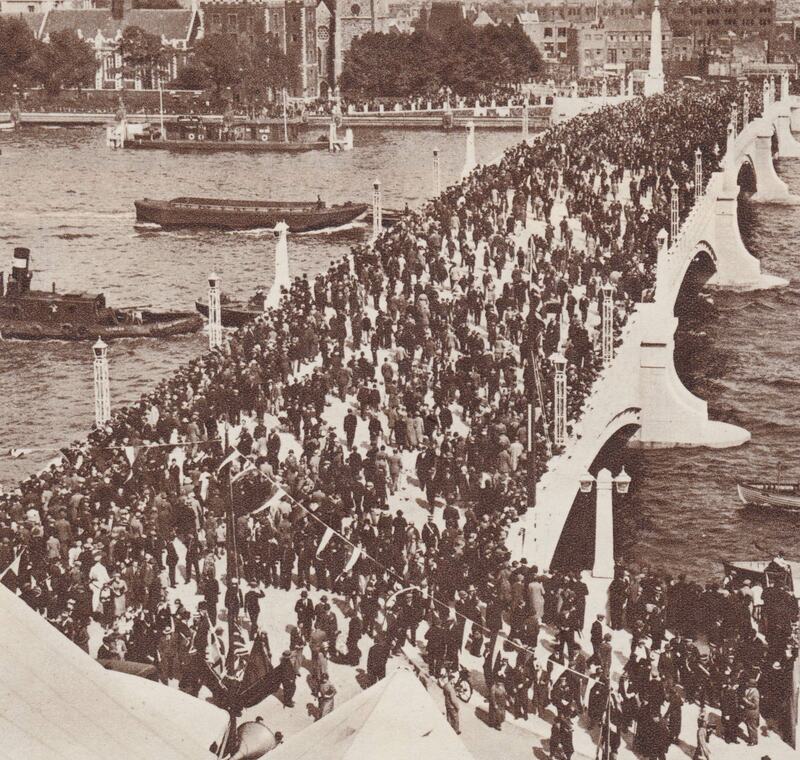 In the unexplained absence of a CGI image from the Garden Bridge Trust, the opening of Lambeth Bridge on 19 July 1932 offers an impression of what the Garden Bridge might look like at peak capacity. As Londoners prepare to vote for a new Mayor to succeed Boris Johnson, one of the most pressing questions for whoever takes over at City Hall is how to handle the increasingly discredited procurement process for Thomas Heatherwick and Joanna Lumley’s Garden Bridge between Temple and the South Bank. Here architect Peter Foulsham RIBA offers his personal take on the increasingly controversial Garden Bridge and calls into question its viability as a haven of tranquility. The offer of a Garden Bridge across the Thames in London immediately fires the imagination into beautiful visions. The appearance of the scheme is a wonderful sculptured jewel to some and not to others, a decision in the realms subjectivity. The fundamental design decision of the appropriate size is in the realms of objectivity. The size needs to be adequate to successfully accommodate both a major pedestrian route and a garden with the ambiance of tranquility. These two events are essentially incompatible, which can only be resolved where plenty of space is available or with ridged segregation and adequate space. The Garden Bridge scheme promoters say it will be the High Line of London. This bland statement fails to point out the two schemes are very different. The impressively successful New York High Line is a walkway five times larger than the area of the proposed bridge. It is located away from central Manhattan on the West side. It is not a garden, it is a walk way with very attractive paving and associated planting, the planting is generally low. The High Line is converted from a redundant high level industrial railway and it does at times get unpleasantly congested. From my knowledge of the High Line and other urban interventions the current design of the Garden Bridge is far too small. The average width is a mere 15.8 meters, the adjacent Waterloo Bridge is 24.0 meters wide. A tranquil and pleasant garden will not be achieved by the current design, it will be more a Flower Show From Hell. The Thames frontage of the adjacent Middle Temple Gardens has a width of 80.0 meters, a bridge of this width would have the scope for both a delightful tranquil garden and pedestrian route. However a bridge of this size in this central location would culvert the Thames and be totally unacceptable. Mike Brown commissioner of Transport for London [TfL] on first arriving at this post in September 2015 stated that his greatest challenge is the rising population both residential and tourist. A policy of dispersal of new tourist attractions therefore is essential. A location away from the central area but adjacent, a location which would be less disruptive and difficult to construct would be ideal. . The promoters of tourism must give some consideration for the quality of life of Londoners. I suggest a large garden bridge linked to the Greenwich Peninsula Ecology Park crossing the Thames via a swing or lift bridge in the center to Silvertown’s Lyle Park. This scheme could include a tourist loop with one crossing on the Fly Emirates cable car and the other crossing on the Garden Bridge, this would further enhance the tourist viability of this site. Due to it’s diminutive size the central London Garden Bridge is a bad design. It will be congested and on peak summer weekends the congestion will be at Oxford Street Levels. Consequently eventually it will be shunned by both Tourism and Donors resulting in a big embarrassment for London and a big cost to the Nation. However, at the time of publication the Garden Bridge Trust seems in complete denial about the shortcomings of the location and the design and is still putting up a barrage of positive propaganda. Even bringing in Michael Wolff, Royal designer for industry, with “inspirational words”; “To some it will be a place of solace and to others a fabulously magical garden”. Wolff also offers some pseudo intellectual writing about St Paul’s, no doubt purposely diverting focus from the real issue, the quality of the design. The Trust’s web site states their objective; “The bridge has been designed to offer a series of unique spaces through out the garden, providing a sense of intimacy on your journey across the River Thames”. However, compare Thomas Heatherwick’s design with quality gardens such as Great Dixter and Sissinghurst where unique spaces are formed with both hard and soft landscaping and genuine sense of magic is achieved. Heatherwick’s design has failed to replicate this. What has been achieved is a pedestrian route with associated planting at the astonishing cost of £175 million and also at the cost of mucking up an already busy swathe of the South Bank. The scheme is essentially mediocre and therefore not sustainable. Add to this the ongoing revelations regarding alleged favoritism and procedural questions over the procurement of the bridge by Transport for London and the only appropriate solution is to start again with a realistically large site area and a fair design competition, without the current Mayor and the associated problems. The result might then be a proud Garden Bridge, a Magical Icon fit for London and Tourism in London, but only on the right site a down river from Central London.